Tried to re-draw it to see how it feels with less rainbow... is it supposed to be this hard to even approximate a feeling of vertical balance/proportion? I had to skew the top ring way down and the bottom trident way up to even slightly diminish the huge-skulled alien-with-spiky-little-feet silhouette. 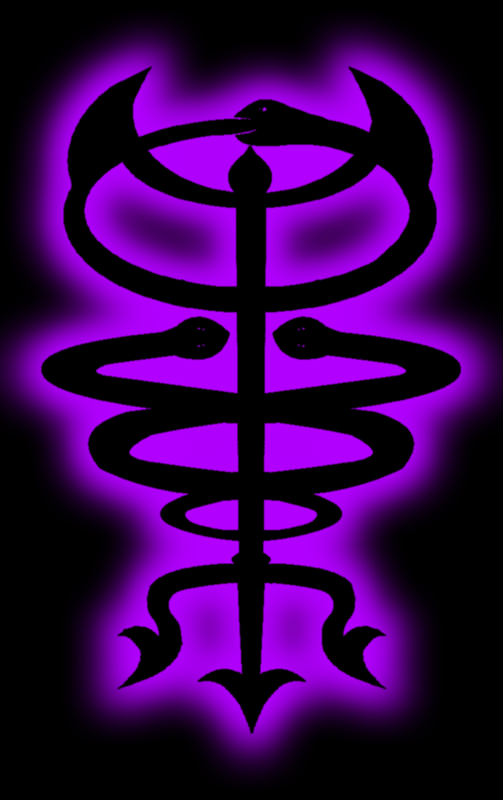 Are the caduceus snakes supposed to describe one figure 8, or two? Your words indicate the former but your image, the latter, so I went off the words for this draft. Is the trident's fork supposed to echo the lower crossing line in the sigil of Mercury? If so, I fear I may still have it too small. It does to some extent, but really has more to with Leviathan and a phurba thingy. ...Did you intend for that to be the same image 5 times over? I find that the forum behaves more reliably when I upload images to either imgur or the OS gallery (http://orderoftheserpent.org/forum/index.php?action=gallery;sa=add) then include them by link, rather than uploading as attachments.